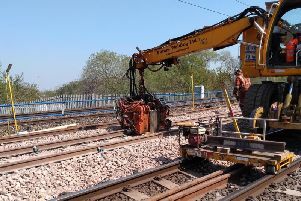 A £7.5m project to improve a major South Tyneside junction has seen casualties fall by over a third. The work on the Lindisfarne Junction, Jarrow, has also seen improvements in journey times and queues in the area since it was completed in summer last year, say council chiefs. Work completed at Lindisfarne Roundabout. Members of South Tyneside Council will be told about the impact of a major highways improvement scheme next week. They will hear about the benefits that the £7.5m Lindisfarne Junction project has brought and how well it has performed against the original strategic objectives. The improvements aimed to ease congestion, improve journey times and enhance safety, and involved widening Lindisfarne and John Reid Road roundabouts and most of the dual carriageway in between from two to three lanes in both directions. The project also included the installation of a large underground tank to alleviate the risk of flooding. Eleven potential options were designed and modelled before the most appropriate scheme was selected. The work was completed in 12 months and opened on schedule in July last year. Data collected shortly after the completion of the project shows that journey times, reliability and queue lengths through the corridor have all been improved. Evidence also shows that since the new scheme was introduced there has been a 36% reduction in casualties – meeting one strategic objective which was to cut the number and severity of accidents. Coun Mark Walsh, lead member for housing and transport, said: “The Lindisfarne junction project is a key element in the council’s vision and forms an integral part of the Strategic Western Gateway. Members will receive the update at the meeting of borough council, on Thursday, November 29, at South Shields Town Hall. Anyone is welcome to attend.